What is a CIFKM Smart Box? CIFKM provides a clear solution to the requirement that each information content should have the desired distribution and confidentiality. In each “Smart Box” are set up “user groups” that may view or modify it. Thus, leakage of information can be prevented with a small number of protocols of easy implementation and low complexity. To make leakage of information more difficult, it is possible that for certain persons and documents, the latter could only be viewed by means of an “ad-hoc” viewfinder that only shows the close button. 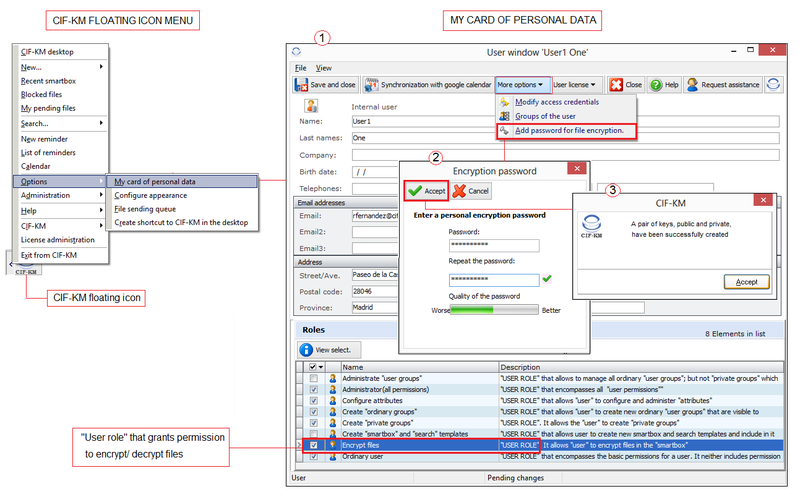 In addition to managing access permissions and faculties of the users over each “Smart Box” the CIFKM client program has built-in functionality that allows encryption of especially confidential files, which are encrypted locally (in the user’s PC) and uploaded already encrypted to the corresponding “Smart Box”. These files are uploaded already encrypted to the CIFKM server. The encrypting faculty is reserved only for users to whom it has been assigned (user role), since it is possible that not everybody in the organization should be able to encrypt and decrypt files. Encryption is secure, robust and it is easy to encrypt and decrypt because the user has only to enter the expression or set of characters (password) he has chosen and only he knows. That a user may have in CIFKM files that only he/she may decrypt..
That a group of persons may collaborate with the certainty that only they may decrypt the files that they use and are made available to them. That two or more persons may correspond via emails, notices and CIFKM notes, with hyperlinks to confidential files thus encrypted, with the greatest security that only they, and no other person, may view them, even though this other person may access their email folders. CIFKM's document managment system (www.cifkm.com) | Mantra Theme by Cryout Creations | Powered by WordPress.